Thanks to a cold spell last week, I’ve officially put my garden to sleep for the winter. While I’m sad to see it go, I was lucky enough to be able to harvest my last few eggplant and a great crop of basil! One of my favorite pasta pairings is pesto, so I knew I had to whip some up. With eggplant also in the mix, eggplant rollatini with a pesto ricotta filling and fresh mozzarella was an obvious big dish dinner that I’ve been enjoying all week! Pesto is often made with parmesan, but I tend to leave it out for two reasons. First, I have a lot of dairy-free friends, and it’s great to have in the fridge for them. Second, pesto freezes better without the cheese! You can always add it later, so you won’t regret holding back when you first whip it up. 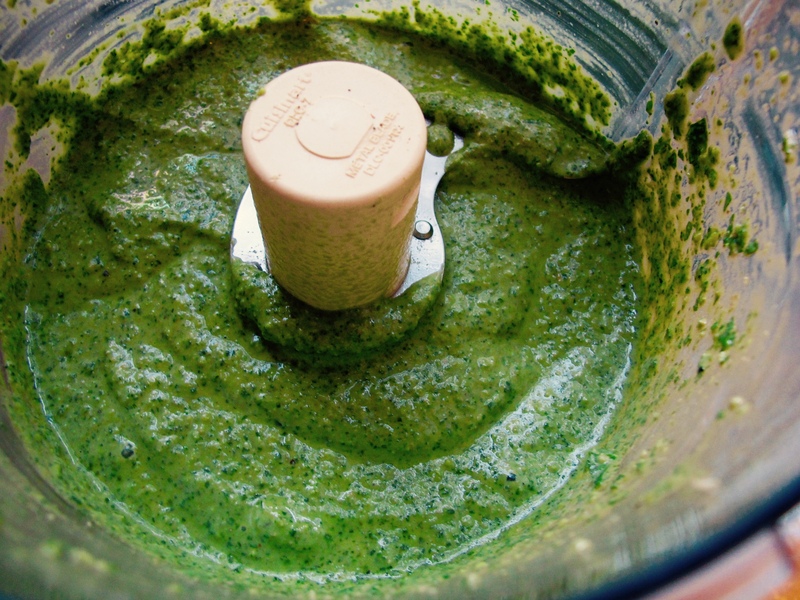 Combine pesto ingredients except olive oil in the bowl of a food processor or blender. Pour in olive oil in a slow stream until blended and smooth. Season to taste. Set aside. Combine ricotta ingredients in a bowl and set aside. Heat 1/2″ of vegetable oil in a skillet over medium/high heat. Dip eggplant slices in seasoned flour and place into pan. Cook on both sides until just beginning to brown, about 3 minutes, and transfer to a cookie sheet lined with paper towels. Preheat oven to 375F. Spread 1/2 cup of tomato sauce in an 8×11 or 9×13 baking dish. Spoon a heaping tbsp of ricotta and 1 tsp of pesto onto a slice of eggplant. Roll the eggplant around the filling and place in the dish. Repeat with all eggplant slices. 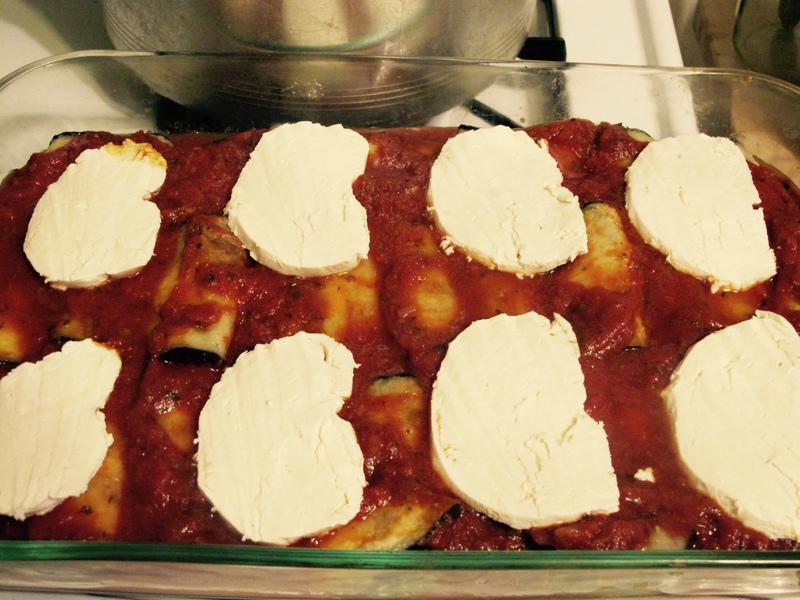 Pour remaining tomato sauce over the top of the eggplant, spreading evenly with a spatula if necessary. Top with sliced fresh mozzarella and bake for 30-35 minutes or until melted and bubbly! 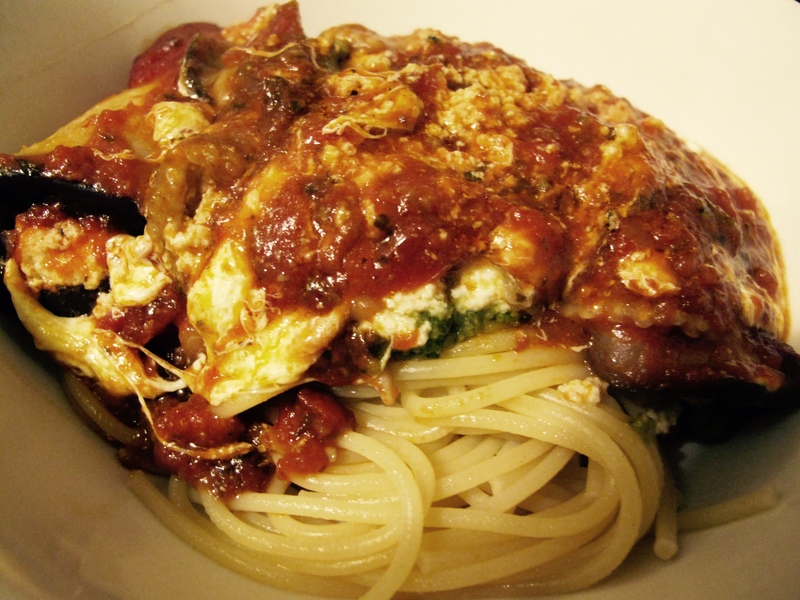 Serve with spaghetti or crusty bread.